I have the quickest tip possible, directed toward everybody who is working their Stopover sweaters with this unspun Icelandic wool called Plötulopi, or plutoloopy as I can’t stop saying. This tip comes from Hélène Magnusson, whose Icelandic Knitter is frankly helpful. 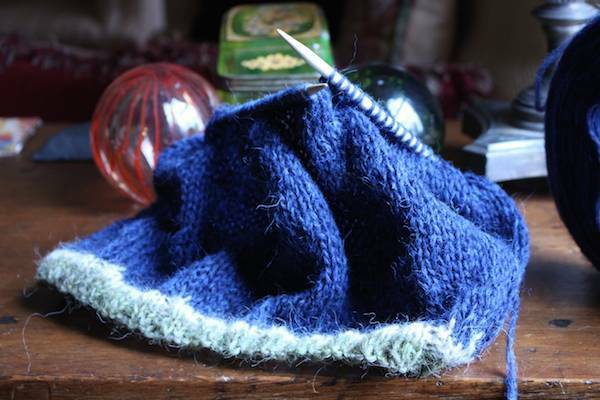 She writes that the edge of a plutoloopy sweater will hold up better if you carry a lace yarn along with the tender, fragile plutoloopy while casting on. Sounded like a great idea to me. 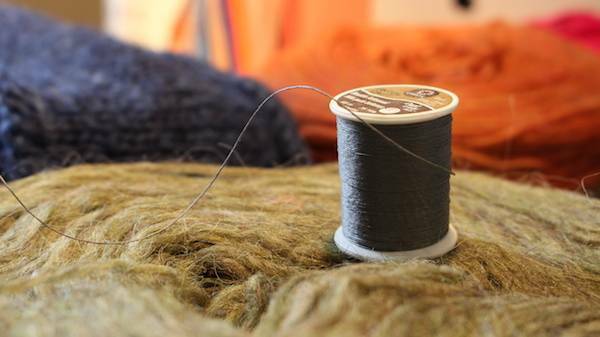 I reached for the nearest non-plutoloopy yarn, which was actually Coats & Clark Double Duty Button Craft Thread, aka the stuff used for Alabama Chanin stitching. It is a thread of unusual stoutness, and it was also closer by than the lace yarn located deep in Stash Zone Foxtrot. At the edge you can see it if you look closely. It’s not even green. But in the general hairy chaos of this not-yarn, it’s not noticeable once you start to marvel at the general feathery lightness of the sweater you’ve started. I’ll report back in ten or twenty years to let you know whether this strand of thread kept this edge in shape. I am having 100% fun with this yarn. It has broken maybe five times so far, a problem akin to a shoelace that comes untied. It’s not like I dropped grandma’s crystal vase. I just rub the ends back together, and off I go. Love it. I have a few plates in shade of grey that a friend brought me back from Iceland a few years back. Not enough for a sweater but I can have some fun with it. Although for some reason, the spit splicing totally makes me gag. I could just use water but that’s too easy. I will gag for my art!! Hand sanitizer, regular water, or tea works just as well. I would imagine one could, if sufficiently sauced enough to lack all judgement, even spit splice with white wine. 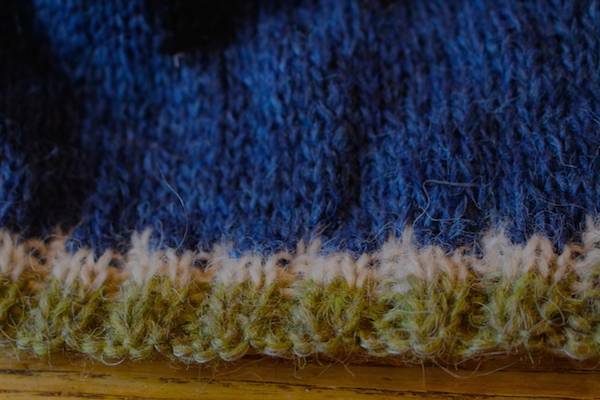 You don’t actually need to splice it *with* anything – just rub the two ends together and keep knitting. Works fine and holds up as if it had never happened. That is a great tip and I love how your sweater looks! I have been wearing my Stopover non-stop. I absolutely love it! I believe you made the awesome Stopover cardigan. Would you be able to give directions as to how to knit one including the edging? Perhaps it is in the Ravelry blog. It turned out so nice!! I don’t quite get the steek aspect. Thank you! Love your colors. I only wish I could feel your sweater through my iPad! 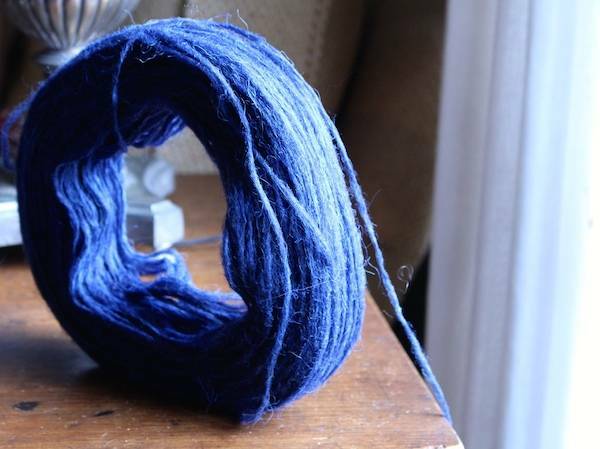 Guess the only solution is to buy my own plutoloopy not-yarn and try it for myself. I think we should take a field trip to Iceland this summer. I totally agree! I’d join a Mason-Dixon trip to Iceland in a heartbeat. Somewhere I actually thought I saw a tip about using thread at the cast-on. Maybe Schoolhouse? Love your colors, especially that blue! I am getting really tempted to get out my own two plate stash. But enough of this Stopover rabbit hole! Back to the Sisters’s Stopover and then on to the A4A new campaign. Ann, you are made of sterner stuff than I. I know I’d be unable to knit with something that kept coming apart and needed splicing every so often. The sweater is beautiful, though, and you’re already far beyond my meager 5 inches – and I started Feb 1. Must knit faster (or give up the rest of my life). Ann, did you go up/down in needle size? Knit a swatch this morning and my measurement using a 10 comes out pretty close to gauge. Looks kinda whispy though. Ann, your sweater looks great! I’m holding off until Iceland in June. Guess I’ll have to take needles with me. Gosh, the lace weight sounds good, u but is worry about thread cutting through the fragile wool. Is that really recommended? I’ve never used this wool, this is purely conjecture on my part. Maybe it depends what materials make up the thread. Long ago, my quilting teacher taught me to use only cotton thread to sew my (100% cotton) patches together, as the other thread would cut into my cotton fabric. Great idea to add the stout thread. I will use that when I get to my own Plotulopi. Beautiful sweater in progress. 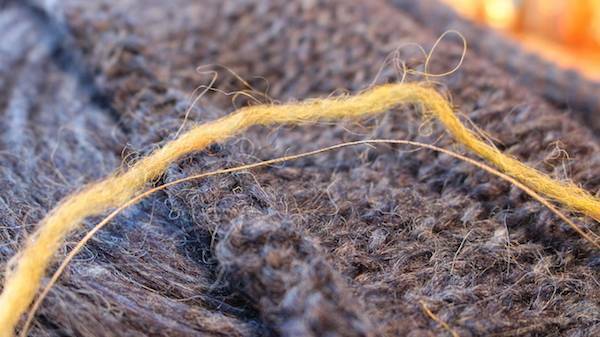 Once you knit the unspun wool, it becomes remarkably sturdy. I knit a simple circular shawl (blanket) and it has held up very well after many years of use. When I was visiting Estonia I bought wheels of multicolor plötulopi — really beautiful. I also found the article on knitting with plutulopi helpful and couldn’t help but giggle at Helene’s polite use of ‘mouth water’. I’m from jersey, we jersey girls just say ‘spit’. Re: Coast & Clark Dual Duty Button and Craft thread, Hah! That’s what I use to overcast my embroidery fabrics. It says it’s 75% polyester, so you may have to wait > 20 years to judge whether it’s still holding up. Or is that just Dual Duty Plus? Yawl have definitely rekindled my desire to knit with Lopi. What really hold me back are the neck lines — they aren’t flattering on me, to say the least. And I’m not experienced enough to wing it. In fact I haven’t knit a pullover since high school! Mostly bec I need to learn bust darts and proper waist shaping for me…. Alas. If only I were 20…. To heck with the knitting. I want that wooden table!